National Aeronautics and Space Administration is planning to send the first unmanned helicopter to Mars in its mission scheduled to launch in 2020, to test the viability and potential of heavier-than-air vehicles on the red planet. Started in August 2013 as a technology development project at NASA's Jet Propulsion Laboratory, the Mars Helicopter had to prove that big things could come in small packages. The result of the team's four years of design, testing and redesign weighs in at little under 1.8 kilogrammes. Its fuselage is about the size of a softball, and its twin, counter-rotating blades will bite into the thin Martian atmosphere at almost 3,000 rotations per minute -- about 10 times the rate of a helicopter on Earth. "Exploring the red planet with NASA's Mars Helicopter exemplifies a successful marriage of science and technology innovation and is a unique opportunity to advance Mars exploration for the future," said Thomas Zurbuchen, associate administrator for NASA's Science Mission Directorate at the agency headquarters in Washington. "After the Wright Brothers proved 117 years ago that powered, sustained, and controlled flight was possible here on Earth, another group of American pioneers may prove the same can be done on another world," said Zurbuchen. However, before the helicopter can fly at Mars it has to get there. It will do so attached to the belly pan of the Mars 2020 rover. "The altitude record for a helicopter flying here on Earth is about 40,000 feet. 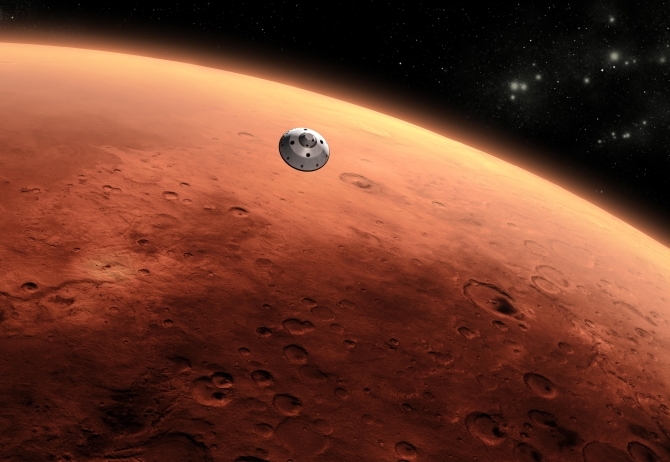 The atmosphere of Mars is only one percent that of Earth, so when our helicopter is on the Martian surface, it's already at the Earth equivalent of 100,000 feet up," said Mimi Aung, Mars Helicopter project manager at JPL. "To make it fly at that low atmospheric density, we had to scrutinise everything, make it as light as possible while being as strong and as powerful as it can possibly be," Aung said. Once the rover is on the planet's surface, a suitable location will be found to deploy the helicopter down from the vehicle and place it onto the ground. The rover then will be driven away from the helicopter to a safe distance from which it will relay commands. After its batteries are charged and a myriad of tests are performed, controllers on Earth will command the Mars Helicopter to take its first autonomous flight into history. The full 30-day flight test campaign will include up to five flights of incrementally farther flight distances, up to a few hundred metres, and longer durations as long as 90 seconds, over a period. On its first flight, the helicopter will make a short vertical climb to three metres, where it will hover for about 30 seconds.